Spicy cloves that we use to prepare food and drinks, are just not opened dried flower buds of the clove tree (or Sigismum). This tree is the "resident" of the Malukas Islands of Indonesia, but now it is found in India, Tanzania, Sri Lanka, Brazil and Madagascar. 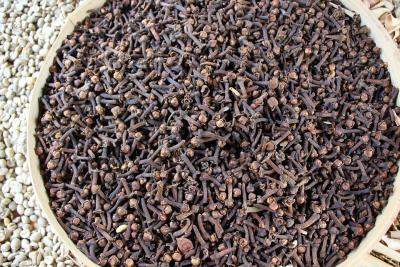 For two thousand years, clove and clove oil were widely used in Indian and Chinese folk medicine. What is the secret of its benefit? In Europe cloves appeared in the fourth century, when these fragrant buds were brought by Arab merchants. In the VII and VIII centuries it became popular as a preservative for food products. Today this spice can be found on store shelves all around the world, and it is still used not only in cooking. Burning aromatic clove contains eugenol, a powerful phytochemical element that gives it a distinctive odor. It is also a natural antiseptic, and it is a part of anesthetics as well. Portuguese researchers noted that eugenol is able to cope with harmful organisms that damage the intestine. In Japan, this property is actively used, protecting dishes from seafood from microbes that cause poisoning. Like sage and oregano, clove contains concentrated stocks of antioxidants that promote the normal functioning of the immune system, supporting cellular integrity and protecting the body from oxidative damage. Clove oil is a traditional means for maintaining oral health. You can use it to relieve toothache and inflammation of the gums. Like capsaicin (contained in hot pepper), eugenol suppresses the sensitivity of receptors that react to discomfort, and the calming effect of cloves is due to the beta-cariophyllene contained in it (it acts quickly but not permanently). The researchers found that eugenol also helps to maintain bone density, reduces bone loss and protects muscles from stretching. Mosquitoes do not like the smell of clove. Try to apply clove cologne on the skin or add clove oil in your body cream, and this will help to avoid bites and redness. Surely you noticed that in Asian countries the way people get sick and grow older differs from that in European and West countries. Many scientists believe that it happens due to the peculiarities of the kitchen, because it is full of turmeric, black pepper, cinnamon, ginger, cloves and other spices. They have antibacterial effect, soothe irritation, maintain immunity, work of the brain, they are rich in antioxidants, and therefore, postpone the aging of the body. However, you should remember that even the most useful products can become dangerous for your health if you abuse them. In addition, it is worthwhile to carefully approach the choice of quality seasoning. It is very easy to do this: just throw a bud into a glass of water, if it drowns or keeps on the water with a hat upwards, then you have a quality spice rich in essential oils. But if the bud floats horizontally, then all the useful substances have already disappeared.